Moderate to difficult due to elevation. Not quite a mountain, but the aptly named Mount Tom at times felt like climbing a mountain. Definitely a challenge because of the changes in elevations, this hike though leads through some of the nicest sections of the Arcadia Management Area as well as some of the most unique. The route chosen for this hike also will take you along one of the most traveled trails as well as some of the lesser known. We started from the Hunters Check Station along Route 165 in Exeter and started at the trail head that is marked by a Mount Tom Trail sign. The trail, blazed white, first follows an old road through an area of new growth white pine among the older taller trees. About a decade ago there was a rather significant fire here and the forest today is coming back to life. Following the white blazes we first crossed the Blitzkrieg Trail, turned left for a short distance, and then back right onto the white blazed trail. Along this stretch on the left in Parris Brook. The brook flows over some rocks creating small cascades in areas. There are some spots to get down to the brook to take photos. Continuing to follow the trail, we then crossed Mount Tom Road and started the first of the uphill climbs that leads to the ledges of Mount Tom. This stretch of trail follows rock outcrops, and ledges as it meanders up and down and over and around boulders before reaching the areas near the top with some outlooks. The outlooks here are now slightly overgrown as trees have grown taller, but there still some spots to sneak a peek. One of the more interesting features of this hike is just ahead. When you reach them, stop and take a break. They are the Mount Tom Chairs, a cluster of stones set up as chairs, arm rests and all. After a short break, we continued along the Mount Tom Trail and then crossed Route 165. Be sure to cross near the crest of the hill for the safest line of sight. Vehicles tend to travel quite fast here. After crossing the highway, we started another uphill climb while continuing to follow the white blazes. The trail does eventually level out as it enters an area of low shrubs among the tall trees. Ahead is the intersection of Old Ten Rod Road, essentially a backwoods trail, where we turned right and then almost immediately left, continuing to follow the white blazes. This last stretch of the Mount Tom Trail actually reaches the peak of Mount Tom and passes through groves of mountain laurel. It is mostly level before it starts to descend to a five trail intersection. The intersection marks the end of the Mount Tom Trail where it comes out to Barber Road and the Escoheag Trail (also blazed white). The rest of this hike is on unblazed trails. Here we turned right onto the wide gravel road and followed it about a half mile downhill looking for a trail on the right with three large boulders at its trail head. If you start seeing the blue blazes of the North South Trail you have gone too far. At the three boulders we turned right onto the southern portion of the Sand Hill Trail. To confirm that you have taken to proper turn you should start seeing a cluster of stone walls to the left of the trail as you start another uphill climb. 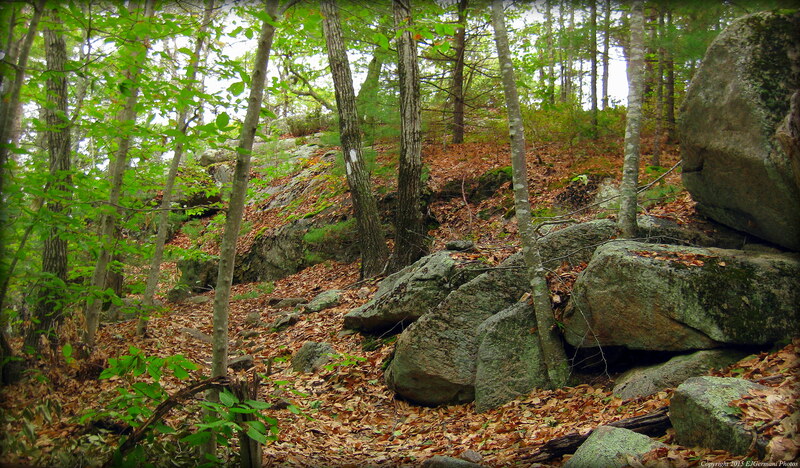 The Sand Hill Trail climbs back up Mount Tom traversing through another area of low shrubs with tall trees. It is actually quite a pretty stretch, again with large clusters of mountain laurel. The trail then reaches Old Ten Rod Road once more. There is a sign to the right on a tree that calls off the Sand Hill Trail, and a stone wall ahead to the right to use as a reference points for the intersection. At this intersection turn left onto Old Ten Rod Road and follow it as it winds towards an area of ledges on the right. In front of the ledges is a massive stone pile that looks as if it might have been part of some quarrying back in the day. It’s all downhill from here, as the trail then bends to the left and comes to an area that is being used for a gravel operation. If there are construction vehicles here, proceed with caution. Continuing straight pass the gravel pit the road continues downhill to an intersection. Turn right here and then continue straight the remainder of the way to Route 165 ignoring all the side trails and spurs. Along this stretch you will also come upon a large area of sand that looks like a miniature desert. If you continued straight, you will come out to Route 165 directly across from Mount Tom Road. Cross the highway and almost immediately on the left along Mount Tom Road is a less traveled road that leads back to the Hunters Check Station where the hike began. Wearing orange is necessary during hunting season for this hike. 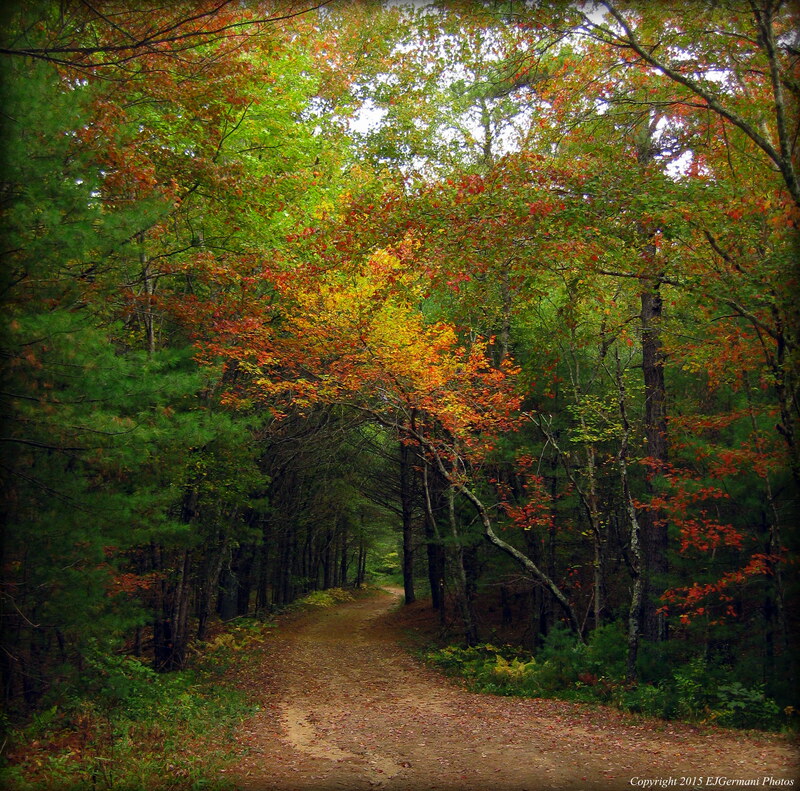 Trail map can be found at: Mount Tom.